A story about how Neopia as we know it came to be. Enjoy! It is year Zero. Neopia is mostly uninhabited. The spaceship careened towards the rocky, barren wasteland covered in clouds. Its pilot, a green skinned scientist with glasses, checked the radar. A young Dr. Sloth, much more happy and interested in more traditional science than the man we know, had left his planet to roam the galaxy, exploring new planets and studying them, picking up many bits of knowledge along the way. He was an accomplished chemist and had a vast knowledge of technical devices, able to build almost anything. He even carried a hand-built sludge gun at his side, though that was more of a lucky charm than a weapon to him. He respected nature and life. The ship blew up dust and rubble into the air as it touched down to the ground. Sloth pulled a lever that opened a door and walked out onto the surface. He adjusted his glasses and looked to the dark sky. “Hm,” he murmured. “No sunlight reaches through the clouds. How interesting.” He took in his surroundings and noticed a cave. He smiled. “That would make a perfect spot to put my equipment.” He pulled out a remote and, pressing a button, watched as boxes levitated out of the ship and floated into the cave. He followed. The cave went down for about eighty meters before Sloth found a flat cavern that was extremely open. It was illuminated by a strange fungus on the cavern walls that gave off an eerie glow. He pressed another button and the equipment in the boxes unpacked itself and set itself up. Within minutes, computers and desks laden with chemical jars stood all over the cave. Frank sighed and was about to start his research when he became aware of a tiny scuttling at his feet. He bent over and picked up what seemed to be a miniscule bug. He looked at it with interest. It was a little green and white thing that had antennae and little crabbish claws, a Moach, though Sloth did not know it. “Well, hello there,” Sloth said, highly interested. “What are you?” He moved over to one of his analytical machines and placed the petpetpet inside. He turned a couple knobs and moved to a computer, where he keyed in a couple lines. The machine whirred to life and Sloth watched as the Moach’s chamber was filled with light for a second before the whir stopped. Sloth took the Moach out, put him in a little box with air holes and returned to the computer. Lines of information had appeared on the screen and Sloth looked at them intently, nodded and mumbling. His eyes widened. “The genetic code of this creature is highly crackable! The gases in the air make the DNA of the life forms on this planet extremely unstable. Why, with just a simple mixture, I could easily...” He hurried over to his chemical tables and worked furiously, mixing concoctions and stirring occasionally. He sat for an hour before achieving his goal. He walked over and picked the Moach out of the box. Taking an eyedropper, he dripped a couple drops of the solution into the petpetpet’s mouth. The Moach gave a shudder and grew three times as large, as well as turning bright orange. Sloth stroked his chin. He looked around, squinting, until he found what he was looking for: another creature, this one a Mootix. He hurried over with his potion and scooped up the bug, this time pouring the concoction straight into its mouth. It, too, grew and changed color. Sloth straightened up slowly watching as the little creature scuttled away into the darkness. He stared at the chemical in his hands. Something stirred inside him; a voice, telling him that he was tampering with nature, that what he was doing was wrong. Sloth shook his head and dismissed it, unsettled. Sloth collected more and more creatures and tested on them more and more, pushing the limits farther and farther. He made them babies again, gave them extra heads, made them bigger, faster, and more ferocious. The kind-hearted scientist’s mind began to warp almost as much as his creatures. Dr. Frank Sloth, in his quest to push the limits of science further and further, was slowly driving himself insane. The loneliness of spending all his time alone with his hideous creations didn’t help, either. He reconfigured his ship’s remote to fire blasts of DNA-rearranging lasers that could mutate any living creature the touch, growing tired of continuously mixing chemicals for hours on end. He spent most of his time collecting specimens and mutating them. Sloth spent years, maybe even centuries, sitting in his cave and transmogrifying petpetpets. He forgot about the sunlight, about friends and family, and everything that made him who he was. As the planet became littered with giant bugs, Sloth grew colder and colder, a shell of who he used to be. After a while, he even considered Neopia his planet, over which he was grand ruler. After all, he was; all of his creatures were completely loyal to him, as part of their mutation. But as more creatures were created, Sloth began finding it harder and harder to find new test subjects. One day Sloth came back from a specimen collection empty-handed. He banged his fists on his desk in fury and threw a vial of green liquid across the room. It smashed and burned a small hole in the wall. “Blast!” he seethed, pacing. “How am I supposed to continue my work if I have no subjects? I have plenty of transmogrified creatures and no new subjects. If only there was a way I could somehow, I don’t know, un-transmogrify them...” Dr. Sloth paused and thought for a second before grinning and snapping his fingers. “That’s it!” he said. “If I were to take the wavelength used in my Transmogrify Laser and reverse it, I can use it to revert all my creations back to normal, and then I can continue my work. But it would be much too tedious to transmogrify every single creature at a time... No, I’ll create one giant device, and use it to un-transmogrify every single experiment on Neopia!” Sloth laughed maniacally and set out making blueprints. He toiled endlessly on the machine. For days he designed and discarded, the cavern floor becoming covered with paper. He toiled away hours on end until he was satisfied. The machine would be a giant egg-shaped dome, operated from the inside. It would be built over his lab, so first he had his soon-to be un-transmogrified subjects take out the cavern roof. Then, they began building. They used their claws to cut metal into squares and Sloth worked at fastening them together. Soon the structure rose to twenty meters tall. Sloth then fashioned an intricate door that opened with a sequence of hieroglyphics. Then the device itself was built; a giant pulse generator, placed in the center of the housing. Sloth also took the time to set up cameras for miles around that linked back to monitor screens in the lab. The process took months, But finally Sloth stood in awe of his creation. The Doctor began pressing buttons and pulling switches. The generator rumbled to life and began building up power, humming louder and louder as it did. Sloth grinned malevolently and pushed a bright green button marked go. There was a terrible silence for a second. Sloth had a split second to draw breath before a gigantic shock wave pulsed out of the un-transmogrifier. A small initial wave rustled his hair before the big one threw him across the room. The structure groaned, but held firm. Sloth hurried to his feet and rushed to the monitors. The effect of the pulse was instantaneous. On every screen Sloth saw his monster shrinking back to their normal proportions and behaviors. Sloth laughed with triumph. That’s when he noticed the floor was quaking. He turned around to see the machine shuddering and making high-pitched noises. Sloth frantically tried to shut it off, but its power was too great. It was too much for the technology to handle. Sloth surrendered and ran out of the building amidst falling transmogrification potions, only taking time to grab his Transmogrify Laser and his Sludge gun. He practically threw himself out the door and shut it just as the machine ruptured. A giant pillar of light burst out of the shell. Sloth stood gaping as the light shot into the sky and expanded. There was a great flash of light and Sloth shielded his eyes. Suddenly all was still. Sloth peeked out and saw that the clouds had changed. They were swirling and churning restlessly, growing lighter and lighter. Sloth was afraid now, and nervously fumbled with the lock on the door, more afraid of the strange weather than the lab. He slinked inside, followed by a handful of petpetpets. A huge hole had blown through the roof and the pulse generator was a smoking, charred piece of rubble. Sloth looked through the roof to see that little pillars of sunlight were breaking through the clouds. Long-ago memories stirred in his head. One such ray of sun hit his hand... and burned. His skin had grown so accustomed to the dark cold of his cave. He seethed, edging back and bumping into the monitor. He glanced at it and did a double take. As more sunlight hit the face of the planet, grass and trees and flowers were popping up. Water swelled from the ground and became ponds, which became lakes, which became oceans. But something else had caught his attention. A little winged creature, a Draik, was sitting in one of these fields, looking around, bewildered. Sloth searched the monitors and saw a JubJub, an Usul, a Scorchio... and more were popping up. Sloth decided that instant that he must leave. He wanted the planet, but he wanted his ensured safety more. He covered his face with his cloak and ran blindly out the door and to his spaceship, trampling flowers and plants as he went. He climbed through the doors of the ship. It was old, but still in good condition. He looked out the window. There were Neopets everywhere and the clouds were almost gone. Panicky, he gunned the throttle and shot off into space. He sighed with relief, but his fortune did not last long. The fuel light started beeping and a loud klaxon sounded. His ship, being solar-powered, had been left uncharged for years and years and only had a bit of fuel left. Sloth frantically searched the space sky and his eyes landed on Kreludor. 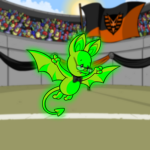 He quickly made for the Neopian moon. He hit the atmosphere just as his ship’s power sputtered out. He braced for impact as the ground swelled up to meet him. The ship hit the surface, bounced, rolled, and was still. Sloth, shaking, climbed out of the ship and looked around. To his surprise, there were dozens of little alien creatures with antennae around him. They were all looking at him very curiously. Sloth looked back at the aliens, which were actually Grundos, and considered this new turn of events. He looked back at Neopia. It makes you wonder what those slorgs are up to, beyond looking cute and snarfing Kreludor's food supply. Lucan and Ryshu had never fought directly, and it was a vicious debate within the school as to who would win if they did.